Updated 3/25/2013 Cut 6. 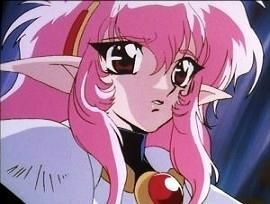 The climactic episode begins with the final confrontation of Hikaru with the most malicious and difficult enemy she faces. But now she can do so, because she understands who Nova truly is. And Nova, now realizing that she no longer has any power over her opponent, looks at her with a touching mix of fear and vulnerability as she starts to back away. 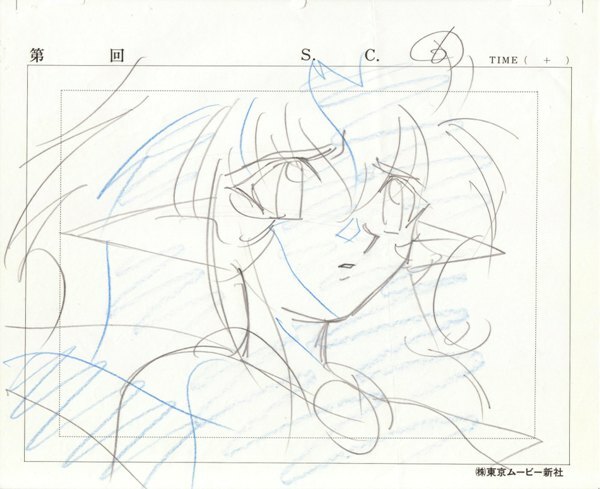 Featured above is the very impressive rough sketch by animation director Atsuko Ishida [石田敦子]. This artist was credited for overall character design of this season of MKR, and also handled the crucial season-opening Ep. 21. An experienced animator, Ishida also served as character designer for Shamanic Princess (1995) and Shin Hakkenden (1999). The thumbnail shows the less effective layout sketch. By chance (but in this world . . .) nearly all the MKR sketches that I got in the sale were from Episode 49, the series finale. I found the couple of roughs that I got in this batch (especially this one) so expressive, that I sharpened my eyes for additional lots of MKR sketches. In time, as the market changed, I was able to add cels to this nucleus, and eventually some of my most cherished MKR acquisitions came from this seemingly random (and cheap!) initial purchase.